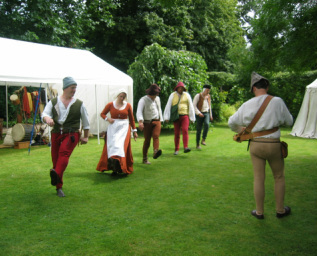 At all of our events you will be entertained with authentic plays from the period. Most days we do three, though sometimes you may be treated to an extra rehearsal of one of our new plays. All done whilst keeping in our historical roles, even the swearing. Some are funny, some more serious, but all have a moral behind them - no room for frivolity for the sake of it in the 16th century. For more information on the plays we perform you can click here. Most of our cooking is done on a wood fire in our encampment. However, at some events we have the use of an authentic kitchen. Each day we cook a meal on the fire, using original receipts (recipes), techniques, implements and ingredients. Over the years the cooks have refined their culinary skills to produce some top nosh. Egurdouce, frementy, mack, chykens in hocchee are examples of some of the dishes produced. Don't know what they are? A cook's never happier than when talking through the dishes of the day. . . . .
A MhC event would not be complete without some music. We accompany the plays and dances and often just play for the enjoyment. 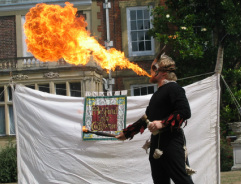 Instruments you will see and hear include English pypes, drums, recorders and some you may not have seen before, such as the crumhorn and rauschpfife. After a play we like to have a good dance. Normally we'll try and show off a bit with a complicated one first - sometimes we even get it right, but if we don't, feel free to laugh - we do! We also like the visitors to join in, and have a few up our sleeves that anyone can do, old and young. We have many Medieval and Tudor skills amongst the group; Bowl turning on a pole lathe, braid making, cooking, comb making, fletching and felting to name but a few. One of our most popular games is trapball. It's a sort of cross between cricket and rounders. There's normally a game going on if the weather is fine, and you can join in at any time.